Createspace Independent Publishing Platform, 9781463523206, 298pp. When Dr. Bob Gray drowns, he leaves his young wife, Eleanore, and their three children with a mountain of bills. In 1902, there are few options open to a young widow, so Eleanore takes the scandalous step to relocate her young children to an abandoned farm deep in the Ozark Mountains in Missouri. There, nestled in the verdant Hill country, Eleanore transforms from a delicate housewife to a self-reliant farm woman. Eleanore struggles to understand the backward ways of the Hill people. Her brother-in-law, Will Gray, tries to shield her from the rough ways of her neighbors, but Eleanore is done being shielded. She makes it her Christian mission to save two girls everyone else has written off, and in doing so, finds peace with her woman's place in the world. But when Will professes his love, Eleanore finds herself struggling not with the question of what she can do for others, but with what she should do for herself. 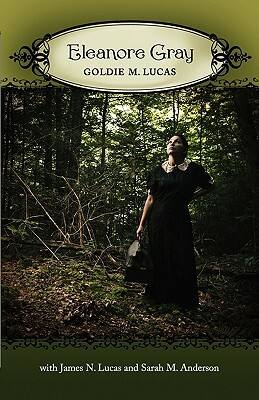 A native of the Ozark Mountains of Missouri in the United States, Goldie M. Lucas was a published poet whose works were printed in the St. Louis Post-Dispatch and the Globe Democrat. Eleanore Gray was her first novel. The story draws heavily upon her childhood memories of growing up in Dean's Creek. Goldie died in 1960, leaving Eleanore Gray nearly finished. Now, over fifty years later, Goldie's final work has finally seen the light of day.